I like to seal the day with a good TV show in the evening. It's my relaxing way of escaping from mundane to exciting and fascinating worlds, even for a while. I'll be honest, sometimes it doesn't really pan out. Many times I had to give up on watching the rest of the episode after just one episode, sometimes on very popular series. Other times I stuck around through and through with the most obscure of productions. 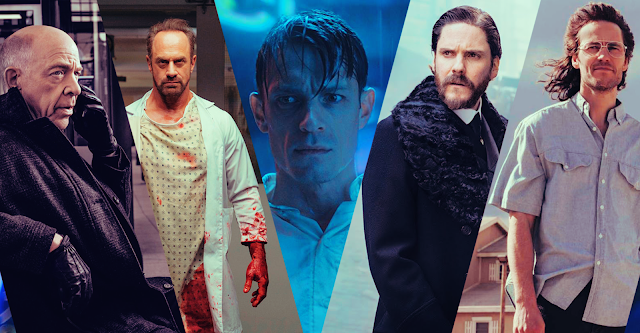 Of course, not all stories are for everyone, so please keep an open mind, even if you are critical, and please try giving these shows at least a try. They are worth it. 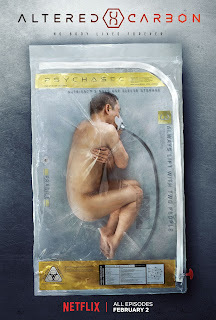 Altered Carbon - A sci-fi neo-noir detective story about a man brought back from his "frozen" prison by a wealthy and eccentric businessman with one request: to solve his murder. Or so it appears. As the story progresses, we find out the plot gets thicker. As you can tell, this futuristic setting is weird. 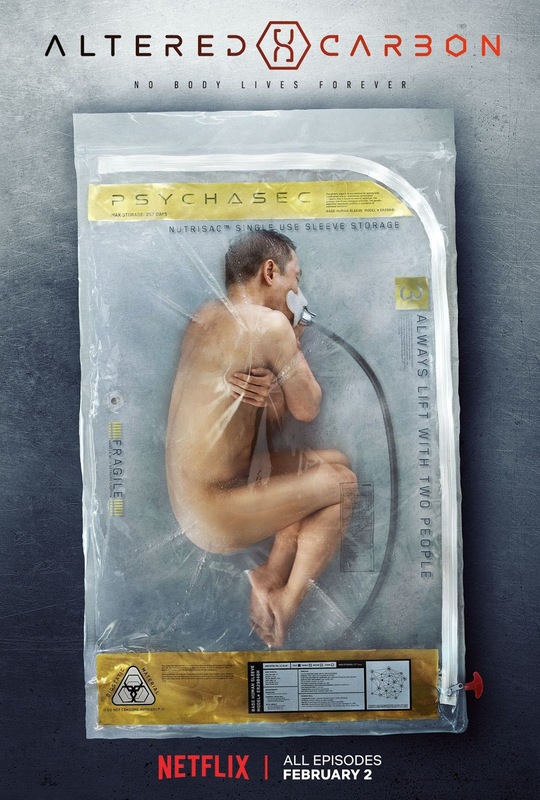 We're thrust into a dark Blade Runner-esque dystopia in which humans have transitioned to a single memory disc containing all their individual experiences and personalities, while bodies have only become "sleeves", commercial and disposable husks. So people never really die unless their discs are destroyed. Don't ask me how it works, the show keeps it very vague. Speaking of Blade Runner, it is very clear that it was a big inspiration for the look and atmosphere, even though it's also based on a novel of the same name by English writer Richard K. Morgan. But at the same time it has strong tones of Gothic and Fantasy. Props to Netflix for another great investment! Happy! - It's a crazy small-screen adaptation from a fairly unknown and short comic book series of the same name written by the very talented Grant Morrison. Personally, I've yet to read the strips, but I'm really curious to find out if it's just as insane and good as the show. It's a heavy brooding detective story about a deeply disturbed former cop who turned to thuggery. 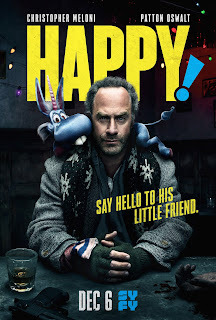 After near-death experience, he starts seeing the quirky imaginary friend of a little girl who was abducted by a creepy Santa guy. As you can already figure out, the contrast to the hardboiled story is the borderline parody comedic tone. The style of how it's shot and edited, the cinematography and direction, combined with the over the top action scenes and great acting talents, make the show an intense ride scene after scene. It also helps that it was co-directed by Brian Taylor, director of Crank and Gamer, and if you've seen those movies you'll recognize his style here too. All in all, this might just be Syfy's greatest breakthrough if handled well. Waco - This is a six-part miniseries about a story that has been told before in a few other mediums as well, movies and documentaries. 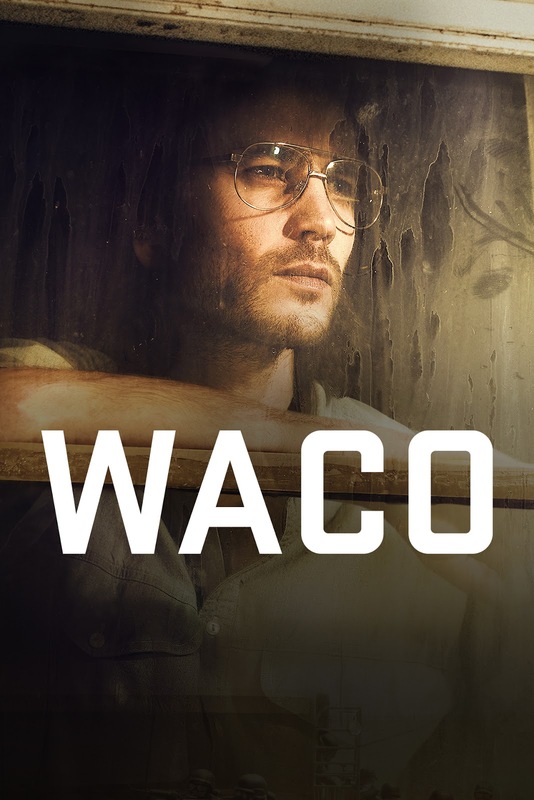 Waco is based on the real siege held by the FBI and the ATF on David Koresh's sect house. Unlike the objective nature of a documentary, this series revolves around David Koresh as the main protagonist and tries to tell the story from his point of view and his justifications for the events. How the real story concluded is tragic and largely controversial, but the show explores both sides of the siege and we're invited to learn about the characters and their motivations as the events quickly spiral towards the inevitable end. This is a bold take on Paramount's part and I applaud them for taking the risk. It's one of those brilliant or floppy types of situations. I'll be honest, if it wasn't for the great acting from talented actors like Michael Shannon, Shea Whigham or Taylor Kitsch (as David Koresh, a surprisingly good performance), the well-written and tense scenes, also some genuine props to the direction and overall production. 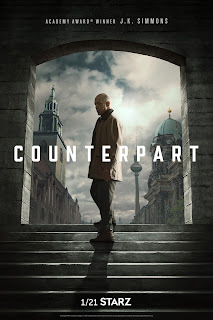 Counterpart - I just love alternate Universe and parallel dimension science fiction. The best thing about Counterpart is that J. K. Simmons is the star, of course, but also that it tries a very realistic take on the premise. It's a dark espionage tale about corruption and assassinations in which anyone can turn out to be the villain, really, and you would be forgiven to be paranoid. 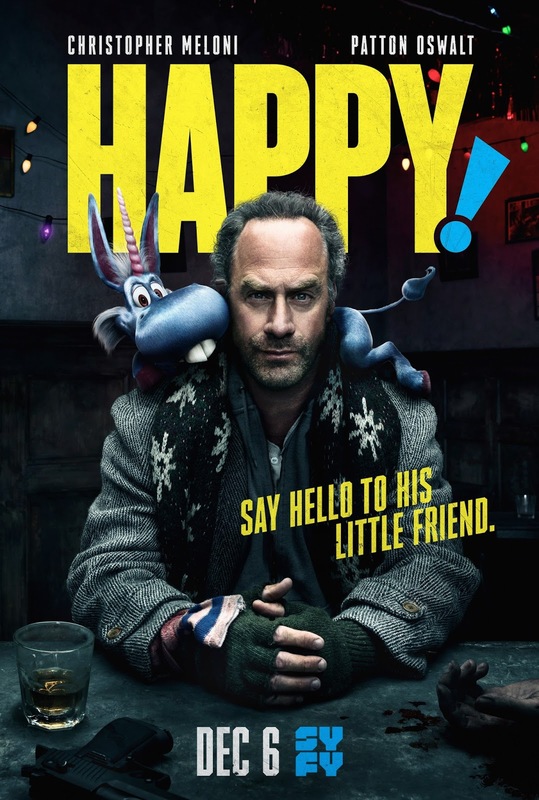 By goodness, does J. K. Simmons shine in this double role! He shifts from the reluctant and shy low-tier employee of a secret UN facility to his ruthless and very confident counterpart that is mixed up in some shady stuff. I am eager to see how the story evolves and it promises some great arcs all around. 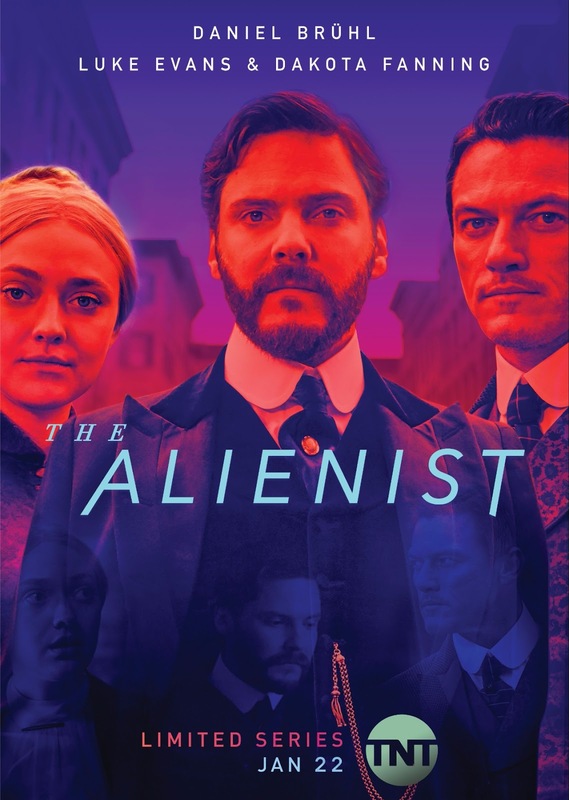 The Alienist - This TNT show doesn't shy away from gore, sexual content or controversy, but it's done tastefully and in context, not just as a gimmick to compete with HBO's edginess. Set in a bleak New York in 1896, the title character (played masterfully by Daniel Brühl) sets out to solve the disturbing murders of a few cross-dressing teenager prostitutes while the police is too busy not being bothered. Teaming up with a newspaper illustrator (played by the always-charming Luke Evans) and an ambitious police secretary (all grown up, talented and gorgeous Dakota Fanning), the alienist must face the bigotry of that time, while the killer/s manage to set up obstacles at every step. It's an intense and smart story, vibrant characters and a rich atmosphere. New York has been recreated in Budapest, Hungary, and it sure shows it at the very steep price of $9 million per episode (yes, no mistakes! ).